Evelyn Robles-Rodriguez, RN, MSN, NPC, AOCN is an Oncology Advanced Practice Nurse at MD Anderson Cancer Center at Cooper in Camden, NJ. She received her undergraduate nursing degree at the University of Pennsylvania School of Nursing and returned there years later to obtain her masters in Oncology as a Nurse Practitioner. She is currently pursuing her doctorate in nursing at Wilmington University. 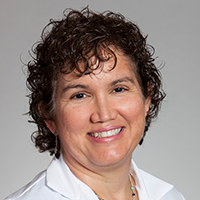 Presently at MD Anderson at Cooper, Ms. Rodriguez serves as the Director for Outreach, Prevention, and Survivorship. She regularly writes and manages grant-funded efforts and is involved in developing patient and community programs as well as the direct care of patients. Ms. Rodriguez is bilingual (English/Spanish) and committed to the cancer education of the lay and professional community.